Norwich Psychogeographical Society: Air Mail! 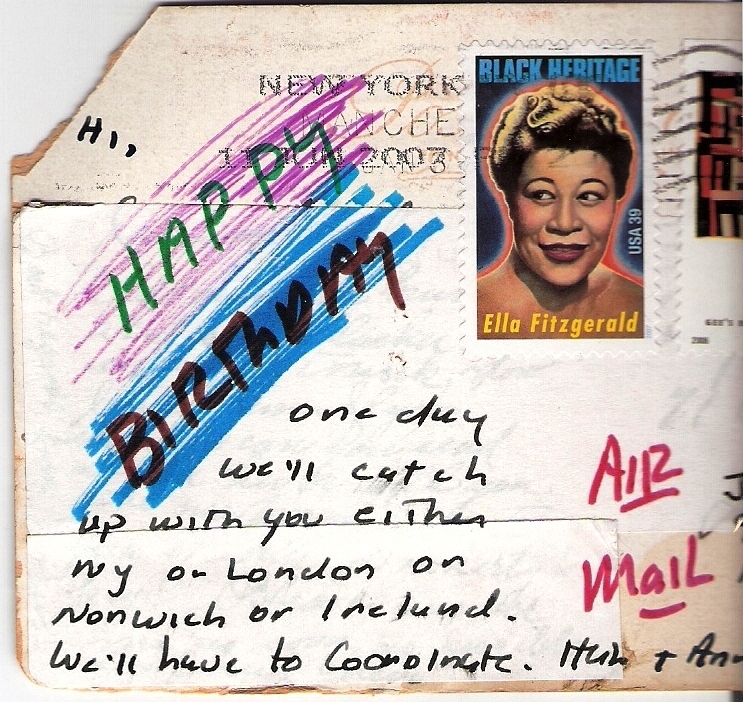 Sometime in 2003 a postcard landed on the doormat of the house I almost lived in at the time, on Magdalen Rd, Norwich. It was for a previous resident, a professor at the University of East Anglia. It was left by the people (not the Prof) living in the house and for a while was stuck to the music stand of a piano that had at some time found its way into the house and refused to leave. The piano, out of tune and in need of some restoration, held onto the postcard for four years.The piano makes me think of the Sussex town Rye. I have no idea why. 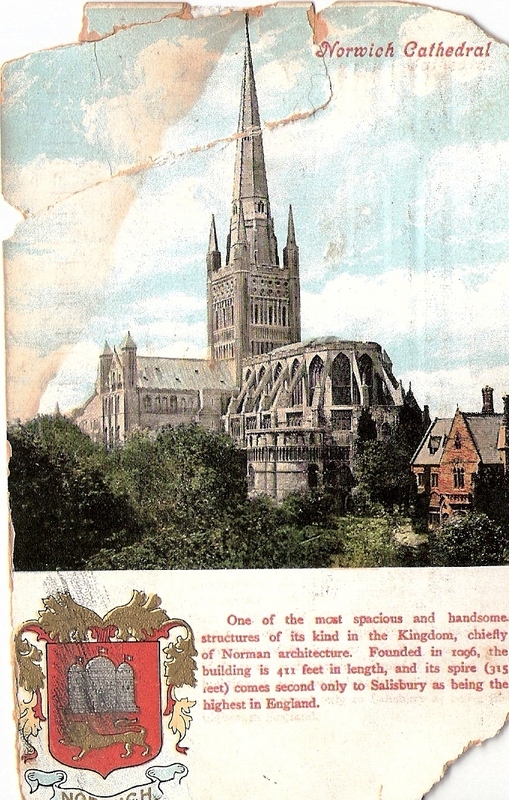 The front of the postcard has a picture of Norwich cathedral viewed from the South-East. There is something a little unsettling about the rear of the cathedral, resembling the thorax and abdomen of some stone insect. At some point in time, this postcard found its way to New York, and after residing with the original recipient, it must have found its way into a junk shop, or was passed on in a shoe box after someone died, either way, and I'm sure there are many other ways, the postcard ended up in the hands of Milo + Ann. Let's imagine some store in Manhatten, where one day Milo + Ann, now in their 70's are taking a stroll along the pavement/sidewalk and come across the thrift store. Flicking through the postcards, Milo discovers Norwich, something resonates, the marbles of memory drop through the holes in his conscious and he cries "Ann, Ann, wouldja look at this!". Ann, a bit annoyed at being disturbed from a 1952 book of circus photographs peers over her glasses. "Norwich, Ann! That's where the Prof lives, man I gotta send him this!" Later, at home, Milo carefully sticks down some white labels over the original message (which taunts us to try and read the palimpsest beneath; the only thing legible beneath Milo's handywork is the frustrating 'best regards' like a ghost waving goodbye from a ferry). Ann, who is still narked at losing her concentration on performing elephants and bears in Coney Island dressed up as women, lets Milo sign the card for her. And here it is, in the wrong persons hands. It's 2010, and the Prof still hasn't had his birthday wishes for 2003. I found out in 2007 that the Prof has an office in the same school of the UEA that I teach in. I moved from Magdalen road, three times in fact, in three years. I forgot about the postcard until now. It had been moving around my desk for weeks, hiding as a bookmark between pages, scooped up with photos and then returned to my desk, somehow unable to be filed, homeless and shifting from room to room. A few weeks back I was commissioned to write a poem that involved Norwich Cathedral. Back on my desk again, I picked up the postcard and thought about the word 'airmail'. 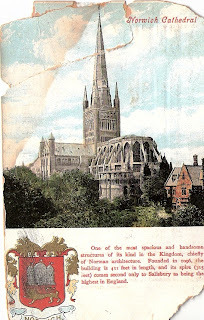 The poem emerged from lines in this postcard and by translating overheard mutterings inside the cathedral. Tomorrow I will slip the postcard under the door.